Tour of Britain winners: where are they now? 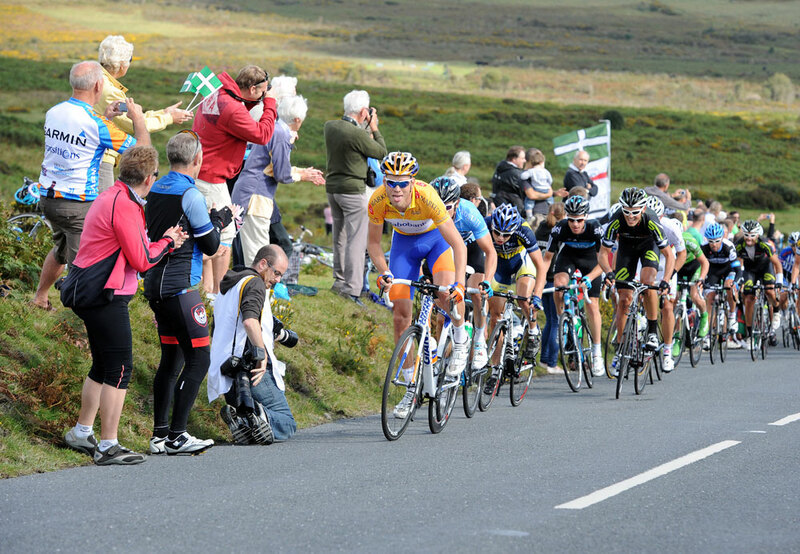 The modern Tour of Britain will crown its tenth different winner in as many editions in London on September 22. Here, Cycling Weekly looks back at the nine previous riders who have worn the yellow and now gold leader’s jersey on the final race podium, and investigates what has happened to them since their victories. How he won: The Colombian took the lead on the race’s second day (of five), an undulating affair from Leeds to Sheffield, and then outsprinted recent Vuelta a Espana leader Daniel Moreno – then riding for Relax-Bodysol – at the Celtic Manor Resort on stage four to seal his overall victory. What happened since: Ardila progressed to the ProTour for 2005, joining Davitamon-Lotto for one season before spending five years at Rabobank. He came eighth in the 2005 Vuelta, but a 15th in the 2010 Giro was the closest he got to surpassing that result. After a year apiece with Geox-TMC and Colombia, Ardilla now rides for the amateur Aguardiente Antioqueño-Lotería de Medellín squad in his native country. 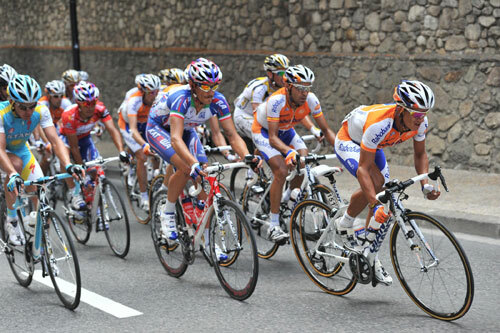 Ardila (r) in action at the 2010 Vuelta. 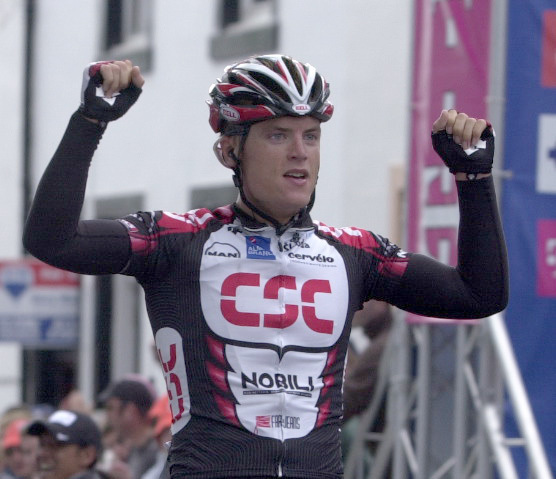 How he won: Third in 2004, Nuyens was part of a 34-rider escape who broke clear early in the opening stage and finished 22-28 ahead of the peloton. The group fragmented in the latter stages, and Nuyens and Michael Bladzun (CSC) clipped off inside the final 10 kilometres before the Quick Step rider took the win. He stayed in yellow for the entire Tour and also won the four-kilometre Birmingham time trial on the penultimate day. What happened since: The bespectacled rider won Kuurne-Brussels-Kuurne in 2006 before his best ever spring campaign saw him take the Dwars door Vlaanderen and Tour of Flanders in 2011. He has raced for Cofidis, Rabobank, Saxo Bank and joined Garmin-Sharp for 2013, but was selected to race the Vuelta over a Tour of Britain return. 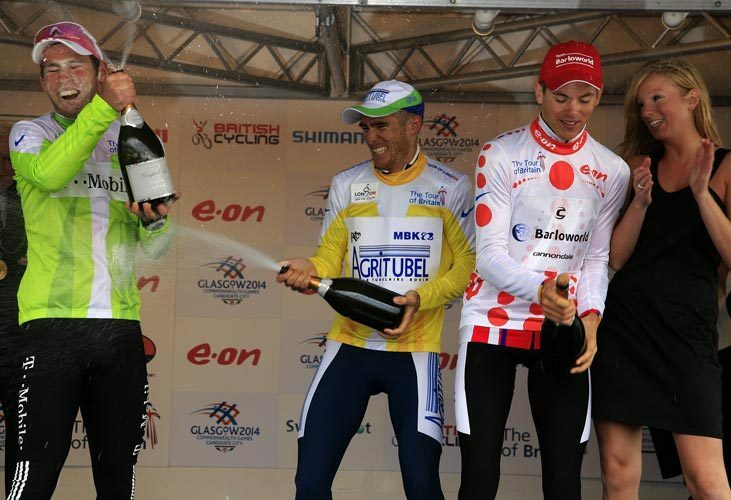 How he won: The Danish rider was part of a three-man group (that also contained future Milan-San Remo winner Matt Goss) who put 2-36 into the bunch on the race’s opening stage from Glasgow to Castle Douglas. Pedersen won the stage and took yellow, but Goss took time bonuses on day two into Liverpool to move into the race lead. However CSC wrecked havoc on the crosswind-affected third stage from Bradford to Yorkshire, allowing Pederson to reclaim yellow and keep it until the finish on The Mall. What happened since: Not a lot. He won the King of the Mountains jersey at the 2007 Eneco Tour, but dropped down to the third-tier GLS-Pakke Shop for 2008. Single year spells at the utterly hopeless Footon-Servetto and the barely better Leopard-Trek teams in 2010 and 2011 were unsuccessful, and Pederson has spent the past two seasons riding for the Danish Christian Watches-Onfone outfit. Pederson wins in Castle Douglas. How he won: By the skin of his teeth. Feillu’s winning margin over runner-up Adrian Palomares was just 0.49 seconds after seven stages. Palomares took the lead on stage four, but had three riders within 10 seconds of him going into the last day. Feillu took a three-second time bonus at the Drumlanrig Castle intermediate sprint en route to Glasgow, which put him level with Palomares and he was declared the winner courtesy of count back from the opening day prologue at Crystal Palace. What happened since: The 29-year-old Frenchman wore the yellow jersey in the Tour de France for one day in 2008. He has raced for Vacansoleil since 2010, and is arguably most well known for being described as “kamikaze” by Mark Cavendish and “crazy” by André Greipel during the 2011 Tour de France. Cavendish (l) and Feillu in a happier exchange on the final 2007 podium. How he won: Like Feillu the year before, Lequatre did not win a stage en route to the overall title. That wasn’t for the want of trying, however: the Frenchman attacked alone in dismal conditions during the third stage in Somerset, but was caught as the peloton split into several groups. His team-mate Emilien Berges soloed to win the stage and take yellow, with Lequatre 29 seconds in arrears. However Berges punctured on stage four into Stoke-on-Trent and couldn’t rejoin the peloton, meaning he handed the jersey to Lequatre, who managed to retain it to the finish in Liverpool it despite only having a slender six-second lead over Britain’s Steve Cummings throughout his tenure. What happened since: Lequatre finished seventh in the 2009 edition, but has failed to win a single race since his Tour of Britain success. He rode for RadioShack in 2010 and 2011 – most notably finishing seventh in Paris-Tours in his second season with them – and now races for the French second division Bretagne – Séché Environnement team. How he won: The Norwegian won four-consecutive stages, but only dislodged Rabobank’s Kai Reus from the top of the GC after the third of those wins in Stoke-on-Trent. He had previously won three stages in 2008, and was the most successful rider in the race’s modern history until Mark Cavendish drew level with him on seven stage wins last year. What happened since: Boasson Hagen has arguably never reached the heights people thought he would after his meteoric start to his professional career. Even so, he won two Tour de France stages in 2011 and was an integral part of Bradley Wiggins’ race-winning team last year. The Sky rider has amassed 24 top-10 finishes in 2013 to date, but only four of those were victories. How he won: Albasini made light of appalling conditions and the one-in-four slopes of Constitution Hill to win the stage and take over the race lead in Swansea on day three of the race. His victory margin of 1-05 over Vacansoleil-DCM rider Borut Bozic remains the biggest in the modern race’s history. What happened since: The man from Mendrisio is arguably the most successful of the nine previous race winners. He won a Vuelta stage in 2011 and after HTC-Columbia folded at the end of that season, Albasini joined the fledgling Orica-GreenEdge team to great effect. He won last year’s Tour of Catalonia having taken the opening two stages and took a Tour de Suisse stage victory later that season. 2013 has seen him add a Paris-Nice stage to his palmarès, and he was part of the Australian outfit’s squad who won the Tour de France team time trial in Nice this July. How he won: The Dutchman with the best surname in the pro peloton benefited from a questionable Sky tactical display in Stoke-on-Trent on stage three to move into the race lead, and extended his advantage on three of the remaining six stages in a dominant display. What happened since: Boom has remained with the Dutch team despite it changing from Rabobank to Blanco and finally Belkin. His penchant for winning week-long stage races continues, as he triumphed in last year’s Eneco Tour and this June’s Ster ZLM. The 27-year-old finished sixth in Paris-Roubaix last year, too. Boom attacks on Haytor, as Geraint Thomas and Steve Cummings attempt to stay with him. How he won: The mix of six-rider teams, no race radios and competitive fields often adds unpredictability to the Tour of Britain GC, yet Tiernan-Locke triumphed in the national tour having been the overwhelming race favourite beforehand. The Devonian moved into the lead after instigating the stage-winning move on Caerphilly Mountain on day six, and even attacked as part of his gold jersey defence on the two following stages into Darmouth and Guildford. Tiernan-Locke beat Nathan Haas (Garmin-Sharp) by 18 seconds to become the first British of the national tour since Robert Millar in 1989. What happened since: Tiernan-Locke joined Sky for 2013 in the least surprising transfer since, er, Mark Cavendish joined Sky for 2012. However, the move has not enjoyed a successful first year, with the rider telling CW recently that his season has been ruined by repeated illness and fatigue. He was scheduled to ride the Vuelta, his first Grand Tour, but he withdrew himself from contention and will race the GP de Quebec (September 13) and GP de Montreal (September 15) instead of defending his Tour of Britain title.